Are you ready for a true whitewater experience? You’ll spend the day paddling the magnificent Class 4/5 North Fork of the American, recognized as California’s quintessential spring rafting trip. Raft on a pristine un-dammed river, cutting through magnificent canyons and picturesque landscapes. Ideal for experienced rafters and first timers looking for an adrenalin charged first run. The minimum age for rafting on the North Fork is 14. We are the most experienced company on the North Fork of the American and take more people down it than most other companies combined. South Fork and Middle Fork veterans desiring more challenging whitewater won’t want to miss the North Fork American this year. 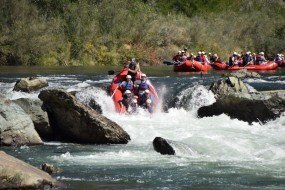 The North Fork of the American River features non-stop adrenalin filled rafting action set deep in a magical wilderness canyon. The North Fork rafting trip features almost continuous technical whitewater rapids. You’ll slalom through Chamberlain Falls, Bogus Thunder, Staircase, and many more. While a hearty deli lunch is served along the river, you can enjoy the spring wildflower display, lush foliage, and abundant wildlife. The last few miles of your adventure offer a slower pace allowing you to catch your breath, relax and enjoy the beautiful scenery of the canyon. This trip will give you a real sense of accomplishment knowing that what you do on your raft, with your paddle, makes a really big difference. This is a complete “all hands on deck” rafting experience. We offer 5 different North Fork rafting experiences, ranging from one day to multi day trips. 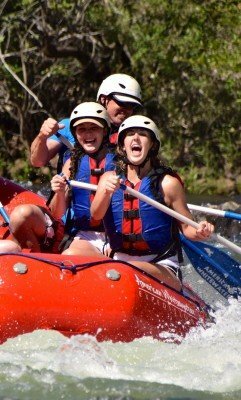 You can combine a North Fork American River rafting trip with the South Fork or Middle Fork for a truly exhilarating and unforgettable multi-day rafting adventure in Northern California. When is the best time to go rafting on the North Fork? The North Fork rafting is a Spring trip fed by snowmelt and is free flowing. This is the only Fork of the American River that is not dam controlled. The rafting season on the North Fork typically starts April 1st and may run until mid June. Everything on the North Fork, from water levels to length of season, depends on the winter snow pack and rate of snowmelt in the Spring. It’s best to call us for current conditions and availability. We are anticipating a long season on the North Fork this year. Trip length is dependent on water level. Visit our Stream flow data page for more information. Where is the North Fork Located and where do we meet for the Trip? The North Fork of the American River located 40 minutes from Auburn is an easy 140 mile drive from San Francisco and about an hour from Reno and Tahoe. From Sacramento the North Fork is only 60 miles up I-80. For the North Fork rafting trip, you have a few meeting options and can pick the one that suits you best. Option 1: Stay at our deluxe campground in the Historic Gold Rush town of Coloma the night before your trip. Your camping the night before is free along with Foam Sleeping Pads and Tents! Option 2: By prior arrangement, meet at our Auburn Meeting area between 7:30 and 8:30 AM the morning of your trip. Trip start times vary on weekends so please call ahead. Leave your vehicle at the secure parking area and ride our shuttle to the river. At the end of your trip, you’ll be dropped back at your vehicle. This is a great option for those coming from near Sacramento, Reno or the Bay Area. Option 3: Meet at our camp in Coloma at 7:00 AM the morning of your trip. Ideal for those living off the I-50 corridor of Sacramento or those driving down from South Lake Tahoe. There is a lot to do and see in Coloma and the surrounding areas, so why not take a few days. Our location and facilities are truly unique. We are the only rafting company with easy river access that has a privately owned resort campground with great facilities like an in ground swimming pool, stocked bass and trout pond, luxury cabins and lush grass covered campsites. Our private campground in Coloma is located in the middle of the James Marshall Gold Discovery State Park. Just a five minute walk and you are in the middle of Gold Rush History! Coloma is in the heart of El Dorado Wine Country and surrounded by beautiful Hiking, Biking and Equestrian Trails. So are you ready to spend a day rafting on the North Fork and having more fun than a barrel of monkeys? Check out the North Fork American River virtual tour with a rapid-by-rapid description. California State Parks has an excellent site with lots of information about the North Fork of the American River and the surrounding area. There is also a North Fork American River Access Map for people interested in exploring the North Fork American River. You can also look at current and historic North Fork Flows. Photos are taken beginning with the safety talk and continue until the end of your trip. Photos are available for purchase at the completion of your trip. Photos will be shown on the big screen following each trip. Super Deluxe Bus Transportation for Large Groups: Round Trip Available! For more questions on our North Fork Trips or questions in general, please call us at 800-825-3205 or check out our FAQ page. FREE use of wetsuit, paddle jacket, and booties. Save $20 – 27! FREE camping at our deluxe Coloma campsite the night prior to your one-day trip. Save $10! Additional camping: $10 per person per day. FREE 4-person rental tent use (set up) complete with foam sleeping pad. Save $18 – 25! PLUS a Safety Kayak will accompany your trip when needed at higher flows. There is never a dull moment on this action packed adventure. Enjoy two intense days rafting down steep, thrilling rapids through pristine canyons. Looking for some adrenalin pumping fun? Get warmed up on the fun rapids of the South Fork and then head to the North Fork for an adrenalin rush of Class V whitewater and some serious fun. Spend a full day honing your skills on the South Fork 21 mile run before heading to the North Fork for a day filled with even bigger drops and more intense whitewater.